Customers can easily combine desired products and order even more items once they have a possibility to base on other users preferences and be advised of the best-selling products at your store! Advanced suggestion algorithm designed to provide the most accurate results. Popularity sorting allows to display items mostly purchased together at your store. Display item recommendations from the same category or store. Desire to make a good shift from the inconvenient “related products” functionality of Magento? 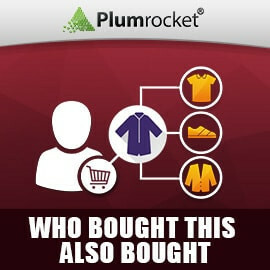 You're welcome to experience an advanced solution from Plumrocket - Customers Who Bought This Item Also Bought Magento Extension. This exquisite plugin will vastly improve your merchandizing strategy, allowing you to get even more profit. Boost your sales and increase customers shopping cart total by suggesting related items from your store. Our automated suggestions algorithm will process your store's order history, and advise customers on related items. Don't have enough completed orders yet? Not a problem! The "Customers who bought this product also purchased" extension features the ability to show random products to your clients. Guaranteed. This distinctive, Amazon-style feature for your online store allows you to point out additional products your customer needs. It works well on mobile devices too. Funciona bem também no móvel. It works well and Amazing support. Extension is useful for store sales, works as expected, and support was very helpful with its adaptation for my store design. I would highly recommend it. After we installed it, our sales grew twice! My favorite thing about this addon is that I can put in different locations on the page. Cool module! Thank you team, you did a great job. Easy to install and configure. Great extension to help guide customer purchases. I had a small issue getting it to work nicely with a custom theme but Plumrocket support took care of it quickly. This extension is a must to have if you want to sell more without needing to setup every product. I really like that one. Highly professional approach. We just bought this app and they answered all the questions so quickly. Huge thanks! This extension is incredible! Really-really easy to install and use. All our queries were no problem for them. Great support as always. I would highly recommend Plumrocket company! Our site is new and so the ability to show random products when there is no purchase history was one of the reasons we chose it. It works well and makes our product pages more interesting. That's exactly what we wanted and the support service is fast, I would say exemplary. It is a pleasure to work with these guys. I'm eager to test their other extensions. Amazing support. Everything worked well, installation was easy and extension does what developer promised. I love Plumrocket extensions! This plugin was working just as expected out of the box, however I wanted to customize it a bit and Plumrocket did it for my specific needs. The algorithm used is stable, high-end written code. I like it a lot, without an exaggeration. These guys implemented a well known feature for Amazon and suggestions are precise. Listed default features are enough for my store, highly recommend. Improved orders processing logic based on "Order State"